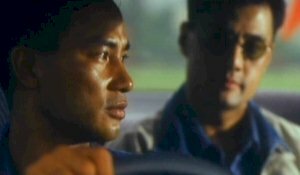 The Skinny: Simon Yam goes undercover in this rather standard cop/triad drama. You could do worse, but you could also do a lot better. by Kozo: Standard entry in the cops vs. triads genre from Benny Chan (Big Bullet). Simon Yam is a former undercover cop who once put away triad brother Yu Rong-Guang. After Yu gets out, he seeks revenge and goes to great lengths to make life hell for Simon. Among his tricks are: kidnapping Simon's girl, framing him for murder, and generally acting smarmy. Meanwhile, Simon develops a thing for Yu's emotionally-damaged moll (Christy Chung).